Amtrak Cascades Train was going nearly 80 mph when it derailed on December 18, 2017. It's been almost one year since an Amtrak Cascades train derailed near DuPont, Washington. The crash killed three passengers and injured more than 60, including drivers on adjacent Interstate 5. One year later, some of the seriously injured are still healing. The courts are just beginning to deal with the lawsuits stemming from the crash. And meanwhile, Amtrak and the state of Washington are waiting for a federal investigation to wrap up before resuming service on the bypass where the derailment happened. Centralia-bound passenger Rudy Wetzel was taking a nap when the speeding Amtrak Train 501 hurtled off the tracks at a freeway overpass on December 18, 2017. The data recorder in the locomotive showed the train entered a sharp curve at nearly 80 miles per hour, well more than double the posted 30 mph limit. "I have no memory of anything happening until I was underneath the train," Wetzel, a former Los Angeles police officer, said in an interview this week. "The car turned over and I fell out." Wetzel suffered a broken back, severe abdominal trauma and was bloodied and bruised from head to toe. "I crawled out from underneath," Wetzel recalled. "There was a woman that finally came up and said, 'Hey, I can help you out here.' She put a fireman's carry on me, grabbed a hold of me and walked me out a ways and set me on a stump. Then rescuers came by shortly thereafter." Fast forward a year — past what seems like a thousand doctor's appointments — and the 82-year-old pushes through a daily regime of physical therapy exercises in his living room. He displays practiced form lifting and bending with five-pound hand weights. He does leg lifts like a younger man. Modified push-ups leave him slightly out of breath. Wetzel said he strives to maintain a positive attitude, though it is frustrating he can't fully regain his prior strength and stamina. "[Physical therapists] estimated that you'll never be what you would have been," said Wetzel's partner and steadfast supporter Lee Dorigan. "You're 60 percent of what you would have been." "I'm recovering. I'm getting better every day, but it's slow," added Wetzel. "I'm still a very lucky guy compared to some of the other guys that got hurt on the train." Shattered bones or spinal cord injuries permanently disabled at least a few of those others. Amtrak crash survivor Rudy Wetzel said he was lucky to have the support of his partner Lee Dorigan and both of their families to help him through an arduous recovery. Wetzel said he has gotten back on Amtrak trains four or five times since the crash to make his usual trip between a Seattle area condo and a farm he owns east of Chehalis. "I'm not particularly superstitious or anything," he explained. "Hey, it happened. It may never happen another time." But Wetzel does want accountability. Wetzel filed one of the more than 35 lawsuits pending in federal and Pierce County Superior Court against Amtrak. Luvera Law Firm in Seattle has about 20 of those cases, not including Wetzel's. Attorney David Beninger said it's easy to blame the derailment on the locomotive engineer who failed to slow down ahead of the sharp curve. But the lawyer says it's becoming "clearer and clearer" to him the root causes ran deeper. "This appears to have been institutionally rushed into service before it was operationally ready," Beninger said in an interview. "It is easy to claim there were individual mistakes when this really was an institutional problem." An Amtrak spokesperson said the railway does not comment on the specifics of pending litigation. In court filings, however, Amtrak's attorneys are refuting the allegations of negligence and inadequate crew training. The U.S. District Court in Tacoma has scheduled trials related to the DuPont crash beginning next September and on into the year 2020. 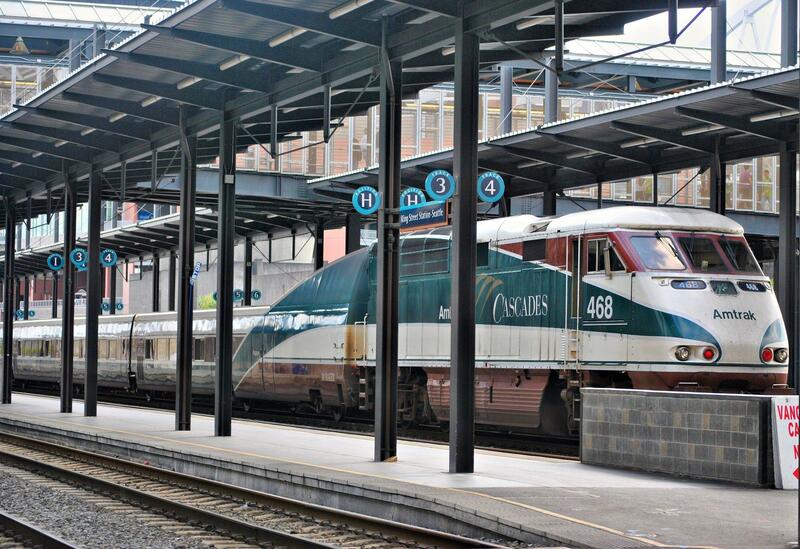 File photo of Amtrak Cascades train at Seattle's Union Station. Meanwhile, Amtrak and its state partners, Washington and Oregon, want to return Amtrak Cascades service to the faster bypass line where the derailment occurred. After the December crash, the Cascades service reverted to its original waterside route between Tacoma and Olympia using the congested BNSF mainline shared with freight trains. But the partners will wait for a final report from the National Transportation Safety Board before pushing ahead. Washington State Department of Transportation rail spokeswoman Janet Matkin expects that report sometime this coming spring. "We do want to make sure that we do address whatever comes out in that report to ensure that we have implemented what recommendations make sense," Matkin said. In order to switch back to the faster line, the state is also insisting on an automatic emergency braking system. Matkin said "positive train control" is now on all Amtrak trains in the Pacific Northwest. "That condition has been met," she reported. "That was one of [the conditions] that we promised following the derailment, that we would not return to the Point Defiance Bypass until that system was in place." A preliminary report from the NTSB and nearly all of the lawsuits filed in the wake of the derailment assert the deadly derailment could have been prevented had positive train control been in operation last December. The oft-delayed technology was in the process of being installed at that time. Matkin said train ridership in the Seattle to Portland corridor dipped in the aftermath of last December's deadly crash. But passenger numbers have rebounded, with this year's numbers now comparable to last year. "Dec. 18 is a somber anniversary for all of us at Amtrak," said a statement emailed by Amtrak spokeswoman Olivia Irvin from Oakland, California. "We remain profoundly sorry for everyone who was impacted by this tragic event – including our customers, the motorists on Interstate 5, and the crew on Train 501, along with their families and the greater community." "We are continuing to cooperate fully with the NTSB’s ongoing investigation, and we will work with them on their findings," Friday’s statement went on to say. Irvin wrote that the railway has taken many actions over the past year "to make Amtrak safer today." Those include a multi-million dollar upgrade to a data management system to better identify safety trends. Amtrak said it also rolled out a "new comprehensive process" for how to train and qualify train engineers and crews to work on new routes. Inadequate training is one of the allegations raised in the lawsuits of people injured after they boarded Amtrak’s inaugural run with paying passengers on the Point Defiance Bypass. Amtrak's CEO has given Oregon and Washington state officials a timeline for when the company will activate automatic safety braking systems in the Pacific Northwest. This is the technology many experts believe could have prevented last month's deadly train derailment south of Tacoma.